The University of Birmingham's medical school is one of the largest in Europe with well over 450 medical students being trained in each of the clinical years and over 1,000 teaching, research, technical and administrative staff. The school has centres of excellence in cancer, pharmacy, immunology, cardiovascular disease, neuroscience and endocrinology and renowned nationally and internationally for its research and developments in these fields. The medical school has close links with the NHS and works closely with 15 teaching hospitals and 50 primary care training practices in the West Midlands. The university has been consistently ranked in the top four of the British Universities & Colleges Sport (BUCS) league table. The university's reputation for sport is a long-standing one; in 1954 it became the first UK university to offer a sports degree, and until 1968 exercise was compulsory for all students. ^ "University's Green Heart campus project completes | TheBusinessDesk.com". West Midlands. 21 January 2019. Retrieved 22 January 2019. ^ "Green Heart - University of Birmingham". www.birmingham.ac.uk. Retrieved 22 January 2019. ^ "Research Fortnight's RAE 2008 Power table". Product.researchresearch.com. Retrieved 29 April 2010. Birmingham Business School (BBS) is the business school of the University of Birmingham in England. Originally established as the School of Commerce in 1902, Birmingham Business School is the oldest business school in the United Kingdom. The Birmingham Quran manuscript is a parchment on which two leaves of an early Quranic manuscript are written. In 2015 the manuscript, which is held by the University of Birmingham, was radiocarbon dated to between 568 and 645 CE (in the Islamic calendar, between 56 BH and 25 AH). It is part of the Mingana Collection of Middle Eastern manuscripts, held by the university's Cadbury Research Library.The manuscript is written in ink on parchment, using an Arabic Hijazi script and is still clearly legible. The leaves preserve parts of Surahs 18 (Al-Kahf) to 20 (Taha). It was on display at the University of Birmingham in 2015 and then at Birmingham Museum and Art Gallery until 5 August 2016. The Cadbury Research Library has carried out multispectral analysis of the manuscript. The ink has yet to have its constituents tested. David James Thouless (; 21 September 1934 – 6 April 2019) was a British condensed-matter physicist. He was the winner of the 1990 Wolf Prize and a laureate of the 2016 Nobel Prize for physics along with F. Duncan M. Haldane and J. Michael Kosterlitz for theoretical discoveries of topological phase transitions and topological phases of matter. Femi Oke (born 30 June 1966) is a British television presenter and journalist. InterVol is an international volunteering charity based in the United Kingdom. InterVol support poverty reduction, conservation and education projects with partner organisations in developing countries. Their projects in the United Kingdom are based at the University of Birmingham, Imperial College London, Lancaster University,, University of Nottingham and Oxford Brookes University. 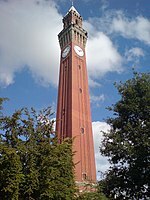 The Joseph Chamberlain Memorial Clock Tower, or simply Old Joe, is a clock tower and campanile located in Chancellor's court at the University of Birmingham, in the suburb of Edgbaston. It is the tallest free-standing clock tower in the world, although its actual height is the subject of some confusion. The university lists it as both 110 metres (361 ft) and 99 metres (325 ft) tall, whereas other sources state that it is 100 metres (328 ft) tall. In a lecture in 1945, Mr C. G. Burton, secretary of the University, stated that "the tower stands 329 ft [100 m] high, the clock dials measure 17 ft [5.2 m] in diameter, the length of the clock hands are 10 and 6 ft [3.0 and 1.8 m], and the bell weighs 5 long tons [5.1 tonnes]".The tower was built to commemorate Joseph Chamberlain, the first Chancellor of the University (with the commemoration being carved into the stone at the tower's base), although one of the original suggested names for the clock tower was the "Poynting Tower", after one of the earliest professors at the University, Professor John Henry Poynting. A prominent landmark in Birmingham, the grade II listed tower can be seen for miles around the campus, and has become synonymous with the University itself. Sushanta Kumar Bhattacharyya, Baron Bhattacharyya, (6 June 1940 – 1 March 2019) was a British-Indian engineer, educator and government advisor. In 1980, he became Professor of Manufacturing Systems at the University of Warwick and founded the Warwick Manufacturing Group. In 2004 he was made a Life Peer and became a member of the House of Lords. M.V. Subbiah is an Indian industrialist, patriarch of the Murugappa family, and a former executive chairman of the Murugappa Group, known for his turnaround of EID Parry. In 2012, he was awarded India's third highest civilian honor, the Padma Bhushan. From 2008 till 2013 he was the Chairman of National Skill Development Corporation. He studied Engineering at the University of Birmingham for two years (but did not graduate) and got his Diploma in Industrial Administration from Aston University. He also studied at Harvard Business School. He was awarded an honorary DUniv by Birmingham University in 2011. Queen's College was a medical school in central Birmingham, England, and a predecessor college of the University of Birmingham. It was founded by surgeon William Sands Cox in 1828 as The Birmingham Medical School, a residential college for medical students. Cox's ambition was for the college to teach arts, law, engineering, architecture and general science. It was the first Birmingham institution to award degrees, through the University of London.Cox went on to found the Queen's Hospital in Bath Row (Drury & Bateman, opened 1841) as a practical resource for his medical students. The 1828 Medical School became the Birmingham Royal School of Medicine in 1836. It became the Queen's College in 1843 by Royal Charter. Kompfner was born in Vienna to Jewish parents. He was originally trained as an architect and after receiving his university degree in 1933 he moved to England (due to the rise of anti-Semitism), where he worked as an architect until 1941. However, he had a strong interest in physics and electronics, and after being briefly detained by the British as an enemy alien at the start of World War II he was recruited to work in a secret microwave vacuum tube research program at the University of Birmingham. While there, Kompfner invented the TWT in 1943. After the war he became a British citizen, continued working for the Admiralty as a scientist, and also studied physics at the University of Oxford, receiving his PhD in 1951.Late that year Kompfner was recruited to Bell Labs in the United States by John R. Pierce, where they together developed the TWT into an important element of the communications age. He received the IEEE Medal of Honor for his invention, and in 1974 received the National Medal of Science. His other stage work includes various roles in the original West End production of Hair, Wolfgang Amadeus Mozart in the 1980 Broadway production of Amadeus, the Pirate King in the 1982 West End production of The Pirates of Penzance, Alan Swann in the Broadway production of My Favourite Year, and King Arthur in Broadway and West End productions of Spamalot from 2005 to 2007.Curry received further acclaim for his film and television roles, including as Rooster Hannigan in the film adaptation of Annie (1982), as Darkness in the fantasy film Legend (1985), as Wadsworth in the mystery comedy film Clue (1985), as Pennywise the Dancing Clown in the horror miniseries It (1990) and Long John Silver in Muppet Treasure Island (1996). The University of Birmingham Medical School is one of Britain's largest and oldest medical schools with over 400 medical, 70 pharmacy, 140 biomedical science and 130 nursing students graduating each year. It is based at the University of Birmingham in Edgbaston, Birmingham, England. Since 2008, and following a departmental restructure, the school became an entity within The College of Medical and Dental Sciences. University of Birmingham School is a mixed free school that occupies a new, purpose-built building located on the University of Birmingham's Selly Oak campus. The University of Birmingham School opened in September 2015, and is sponsored by the University of Birmingham and managed by an Academy Trust. The university obtained twenty million pounds for the school's building, but later supplemented this with three million pounds of its own money to pay for expanded features such as wider corridors and very large classrooms. The curriculum includes a commitment to teaching virtue and empathy as part of curricular as well as extra-curricular activities.In 2016, the school had 1768 applications for 150 places, and was considering expanding its intake. Set in 7 acres (28,000 m2), it is notable as a rare surviving example of an early 20th-century high status suburban "villa" garden, inspired by the Arts and Crafts movement of the Edwardian period. Both Winterbourne Botanic Garden and Winterbourne House are owned by the University of Birmingham and are open to the public as a heritage attraction. The site is also part of the University conference park.